Members of England's highest order of Chivalry, the Most Noble Order of the Garter don a blue velvet mantle, lined in white satin, on ceremonial occasions. 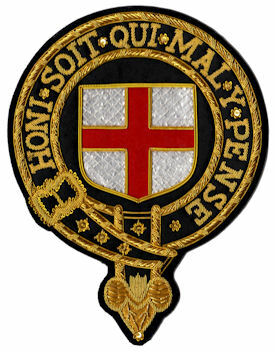 Upon this cloak, the heraldic shield of St. George's Cross encircled by the Garter is sewn onto the left shoulder. Our reproduction of the badge is crafted in high-quality gold and silver metal bullion embroidery, measuring 6.5" x 8.5" and is ready to sew onto your mantle.